Experience a wide range of color & contrast. Clearly distinguish the transition from dark to light. Even the darkest scenes reveal rich details, promising a more immersive viewing experience. 4X more pixels than Full HD means 4X the resolution, so you’ll clearly see the difference. Enjoy smooth, crisp action even in the fastest scenes with Motion Rate 120. Samsung OneRemote automatically detects and controls all your connected devices and content with no manual programming required*. 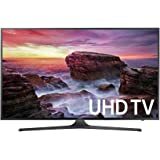 What level of performance can I expect from 4K Color Drive? 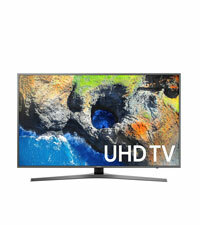 This TV comes equipped with 4K Color Drive, which allows the TV to accurately reproduce a wider spectrum of colors. You’ll experience an exceptionally vibrant, pristine image that makes each scene more lifelike. Does this TV feature true 4K UHD resolution? Yes. This TV offers four times more pixels (3840x2160) than Full HD, creating an image that is four times more detailed. The result is a breathtaking viewing experience that renders your favorite media with astounding clarity. 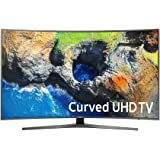 How does 4K HDR Pro improve the TV image? 4K HDR Pro allows for very bright and very dark objects to be shown on the same screen with no loss in resolution. In other words, the TV can produce deeper and more vivid colors while showing more shades in between. 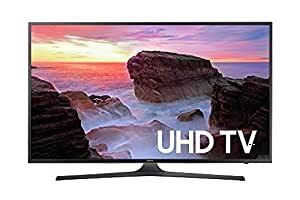 Can this TV connect to a Wi-Fi network? Yes. 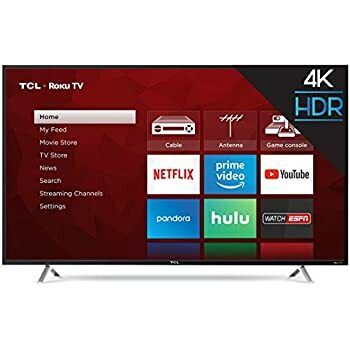 This TV features full Wi-Fi connectivity, allowing you to connect to it a wireless network and stream. 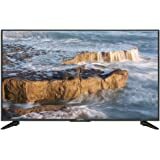 What inputs and outputs does this TV include? 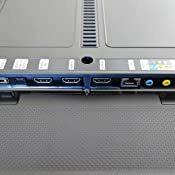 This TV comes outfitted with a full array of inputs and outputs, including 3 HDMI ports, 2 USB ports, 1 Ethernet port, 1 component input, 1 composite input, 1 RF input, 1 Digital Audio output, and 1 RS232C serial interface. 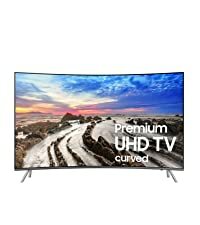 From $849.99 Add to cart to see price. Why? $349.99$349 99 $1,157.54$1,157 54 $597.99$597 99 Add to cart to see price. Why? Before I purchased this television, I read almost all of the reviews here. There are some complaints, which made me research the product further. I was apprehensive as delivery day arrived. The television has exceeded my expectations. All of the things that people complained about are non-existent. Someone here complained that the television "isn't bright enough" and that the "contrast was better on his old TV." I have no idea what he's talking about. The factory default settings on the television weren't optimal, but on the Samsung main menu (on the television) there's "expert settings" to decrease the color saturation and increase the contrast. And even leaving the brightness setting at the mid-range level, the television is plenty bright enough - more than bright enough. 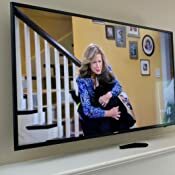 Someone else complained that viewing the television from the side created blurring. Nonsense. I was nearly looking at a profile of the screen and could see plenty of detail. Someone else complained that the built-in speakers weren't the greatest. Maybe they didn't know that under the Audio expert settings there's an equalizer, which is a moot point, since my television linked to my Sony sound system flawlessly. 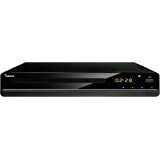 As a matter of fact, linking all of my systems (cable box, sound system, game systems, etc.) took (at most) five minutes, and everything works fine. 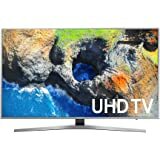 Other people here have said that we should save our money and buy an OLED television instead. Nonsense. The picture on this television is absolutely stunning, and I now understand why some people commented that the picture almost looks 3D - it's that good. What surprised me the most was watching The Simpsons (don't judge me:^) On the newer episodes the color and detail are phenomenal, but on the older episodes (S1-S5), they're now the same quality as the newly run episodes today. I cannot explain that, since the older episodes on my last TV always had a "watercolor" look to them. Since the Amazon delivery service installed my television in about 10 minutes, there is absolutely nothing that I can list as a negative here. Absolutely nothing. 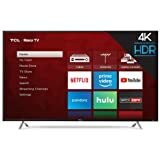 Given the current price of this television on Amazon, I wouldn't hesitate to purchase it if I were you. Maybe wait until Black Friday to see if you can get it a little cheaper, but if they sell out, you'll be sorry. Trust me. 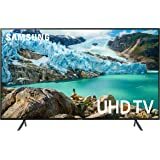 5.0 out of 5 starsIncredible Picture Quality, Excellent Features = A Great TV! 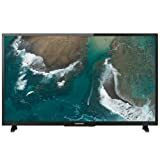 It's been about seven years since I purchased my last HDTV - one of the last generation Panasonic plasma televisions that I purchased for my home theater. 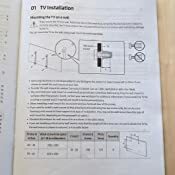 So when my 10-year-old Sharp Aquos LCD HDTV started giving up the ghost I knew I had some reading up to do on current television technology - from backlighting to SmartTV features a lot has changed in the HDTV landscape. 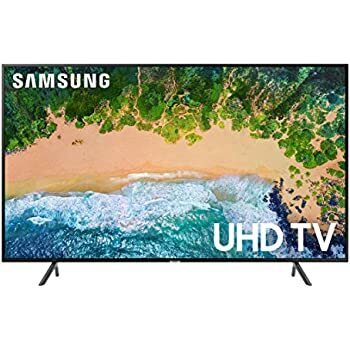 I, of course, ended up selecting this Samsung 50" UN50MU6300 (just '6300' from here on) after comparing several brands including models from LG and Sony. For a time I was considering a much more expensive Sony XBR model but ultimately justifying the expense was difficult for a family room television that spends more time tuned to Disney Junior than anything else. 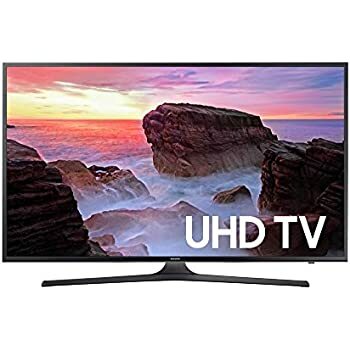 Considering just how much prices of HDTVs have fallen in recent years I felt like the sub-thousand dollar range still provided plenty of features and excellent picture quality without a lot of the extras that my family and I wouldn't really notice a whole lot. I knew the specs of the 6300 before it arrived but it's still impressive how much smaller and lighter HDTVs have gotten. My old Sharp Aquos HDTV was a marvel for its time but the 6300 is inches thinner and a good 20lbs lighter. The box is thin and small enough for a single person to move around without any issues. Samsung gives plenty of interior protection for the TV in the form of molded styrofoam and it's very easy to open the TV and remove it from the box. Initially, I opted to have my wife help me setup the TV but after seeing how light this set is I decided I could just get it setup myself. My biggest advice if you're setting the 6300 up on a wall-mount is to ensure you have the proper size mount and most importantly screws for the job ahead of time. I figured the same screws that worked on my Aquos would suffice with the 6300 and that is not the case. Samsung uses a VESA-standard 400mm x 400mm form factor. My mount was thankfully compatible but not the old screws. Be sure to have size M8 1.25 x 20mm screws on hand! You can pick up a set of these at any local big box home improvement store for about a dollar. I did temporarily test the included stand on the 6300 while I was running to the hardware store and I'm not impressed. For the price of the set I really shouldn't expect too much I suppose but the stand is really poor. It uses thick plastic but it's sort of dull and doesn't seem to fit the TV very well. 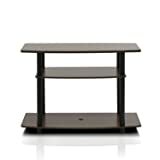 The stand requires eight (8) small screws (included) to assemble and secure to the TV. 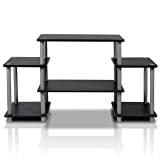 My biggest concern with the stand is that it seems to leave the TV pretty wobbly. This was just a temporary solution for me but something to be aware of if you plan on using the stand full-time. The overall build quality of the materials is definitely a step down from my old Aquos HDTV. The price range for this television seems to leave little left over for upgrades to the exterior and honestly, I'm good with it. The outside plastics are all black matte plastics. Thankfully the bezel is small so the cheap plastics aren't all that apparent anyway. I'm a much bigger fan of the television's picture and performance in menus. To keep it succinct I think the picture is incredible - the television is both bright but manages to produce very nice black levels. Scrolling through the TVs menus is fast, efficient and extremely responsive. Overall I'm very satisfied with the picture on the 6300. This set is in a bright family room in my home and the picture looks amazing. 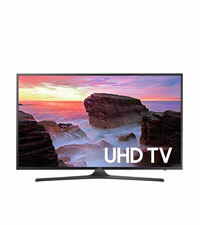 One, item to consider is the Eco setting which adjusts the brightness of the TV based on ambient lighting. I noticed the TV tended to look too dim and turned this setting off. 1080P and 4K content especially looks stunning. The edge-lit LED technology that this set uses really pushes black levels way down and helps to create a very clean, realistic picture. One area I did notice this TV seems to have difficulty with is very wide viewing angles. Just because of the setup of my room walking in I'm able to see the set from the side and the off-center viewing angle was worse than I expected. I'm not sure what causes that but thankfully our sitting arrangement is dead-center on the 6300 so this isn't an issue when we're actually sitting and watching TV. 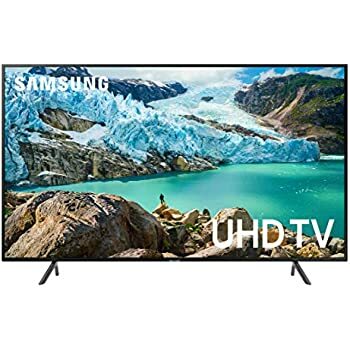 Since Samsung's remote is a pretty big departure from my other HDTVs remotes I'm throwing in a section for it for review. 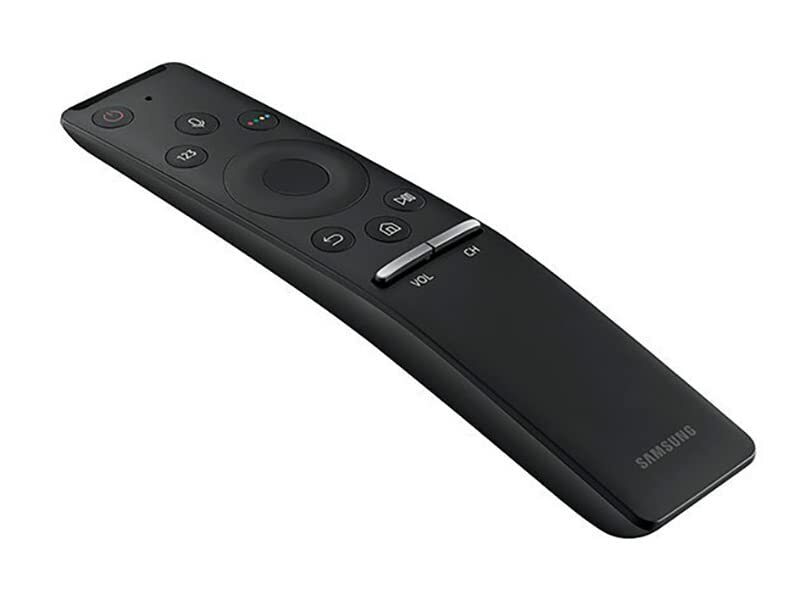 In short, Samsung has redesigned the TV remote to get rid of the plethora of buttons and large form factor. Instead, you get a very svelte remote with much fewer buttons. The idea is to utilize onscreen menus to do things like change inputs and sources but still retain core features like audio adjustment, mute functions, channel selection and so forth on the physical remote. 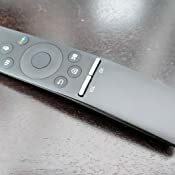 Another huge feature is the inclusion of a microphone built into the remote that utilizes voice commands for operating the television. The remote seems like one of those areas where people are either going to love it or hate it. Personally, I was uncommitted to either camp until I spent more time with the 6300 and now I love the remote. In fact, going back to my Panasonic plasma's remote just seems so antiquated. In a lot of ways, Samsung's implementation of the Smart Remote/One Remote is very similar to my Roku 3's remote. By now most people understand the concept of "apps" or applications. 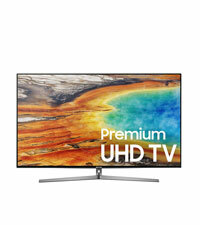 In this case, Samsung has their own app environment for their television lineup. 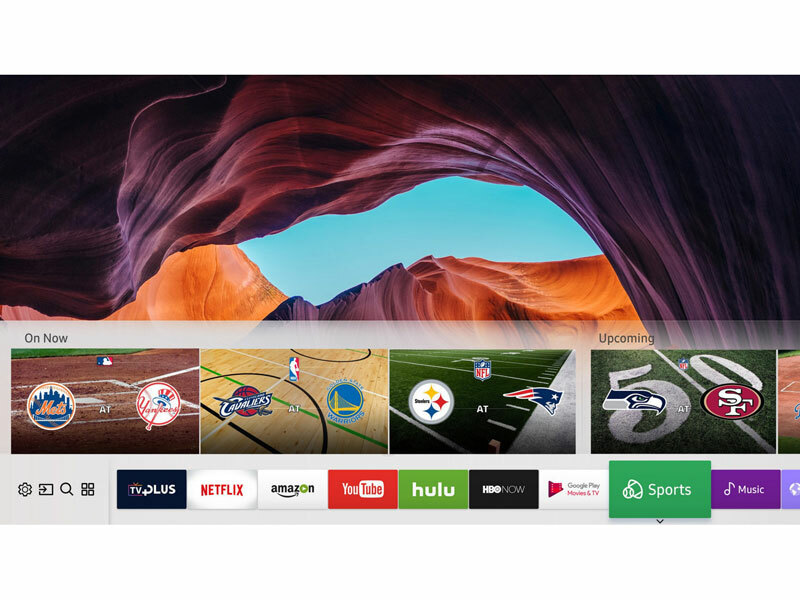 A lot of the biggest apps will be readily available in the Samsung Marketplace, however, not every channel you may want is available. For instance, on my old Aquos TV we mostly watched content through our Roku 3 which to my knowledge has one of the largest libraries of applications available. Samsung's marketplace is much smaller so some apps are bound to be missing. Case in point: Disney and Disney Jr. and Nickelodeon apps are nowhere to be found. This can be a major issue depending on your viewing habits. Thankfully, the largest players - Netflix and Amazon are present. 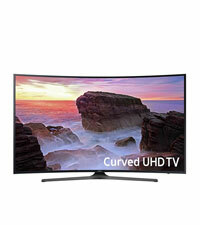 So just be aware that your mileage may vary with the SmartTV features here. All things considered, I feel like the UM6300 was an excellent choice. 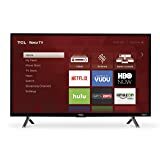 This TV offers a ton of features, incredible picture quality and 4K resolution for a budget conscious buyer. There are some not so great materials used, especially in components like the stand and off-angle viewing could definitely be better. But for the price, I think this is definitely the TV to go with. Recommended! WATCH OUT FOR the TV ADS AGREEMENT DURING SET UP!! 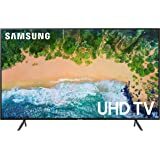 I read all reviews and made sure I didn't accept those extra agreements when I was setting up my TV. Other than it TV is great! As an inexperienced TV owner I think it's perfect. Delivery was awesome! Guys were professional and quick. They set it up and turned it on to make sure it wasn't broken and that's it! Just watch for the ads if you don't want any. They will ask you at the beginning. 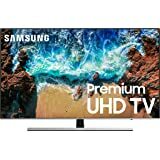 Great TV with a fantastic image but the ads that Samsung shoves down my gullet are completely unacceptable and in some cases make the TV unusable unless I swallow the load of ads. Turn on the TV, can't select the LIVE TV tile because an ad for an app is covering it. Despite refusing to agree to the stated terms and conditions I have no choice but to click on the excrement, wait for it to load then close the intrusion. I am limited to 3 options: completely disconnect the smart TV from the Internet (unacceptable), tolerate the intrusive ads (heck no), or return the TV and buy another brand. Samsung tech support calls this "shove it down your throat marketing" a feature. I am barred from using the Netflix app and the service I pay for unless I agree to allow Samsung to drown me in ads and collect my information. Unacceptable. 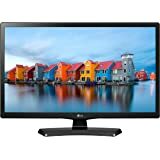 The cost of returning the TV is high so I have opted to give it to a local hospice and buy another brand of TV.